"...then I made a little joke and said maybe the only way to really protect the world from the Hulk if he ever goes really nuts is ta stick him in a rocket and shoot him out into space...let him be somebody else's problem." As plans go, you could do a lot worse. The Hulk may have saved the world as we know it hundreds of times over, but his unparalleled strength and unchecked rage are to blame for numerous deaths and who knows how many billions of dollars in property damage. Sure, the Hulk's never killed anyone in cold blood -- the only time he's stomped on any civilians have been during his mindless rampages -- but that's not good enough. A secret cabal of superheroes have deemed the Hulk far too great a risk to continue roaming free. They can't cure him...they can't imprison him...the only way to prevent the Hulk from doing any further damage to the planet is to ensure he's not on it anymore. Misguided...? Maybe. They're not cruel, though: rather than duping the Hulk into walking into a spaceship and flinging it into the sun or something, they pick out an idyllic, far-flung planet...one lush with vegetation, teeming with game for him to hunt, and devoid of any intelligent life to torment him. 'Course, this sort of thing has been tried before, and it didn't work then...not gonna work now. An enraged Hulk smashes the ship off-course, sending it careening away from paradise and hurtling instead towards the barren wasteland of Sakaar. He barely has a chance to step out from the wreckage of his ship before becoming enslaved. Weakened from that passage through a wormhole, the Hulk can't even scream that he's the strongest one there is. He's vulnerable...he bleeds. 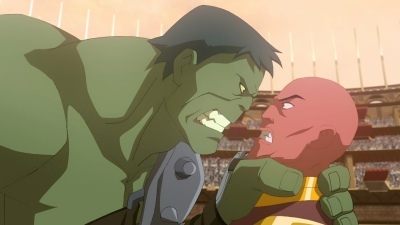 "Planet Hulk" is a risky choice for a direct-to-video animated adventure. Most of these movies of Marvel's up to this point have been origin stories, looming around comfortable territory with a familiar supporting cast and an iconic villain or two. "Planet Hulk", meanwhile, opens off-planet, the Hulk never reverts back to his human form and I don't think so much as mentions Puny Banner, and virtually every last character was created expressly for this story. So much of the appeal of the original comic arc stems from its sprawlingly epic scale, one that's driven as much by an intense emphasis on characterization as it is by the colossal scale of the war that's quickly mounted. Its quieter moments are as compelling as the megaton battles, and translating a saga spanning more than 350 pages into an animated movie that barely creeps past the 70 minute mark minus credits...? Caiera, the Red King's lieutenant, is near-invulnerable and repeatedly stands toe-to-toe with the Hulk...taking the time to lob out a definition doesn't meaningfully change the story. The only really confusing plot point is that while the comics take the time to explain the rules of the gladiatorial fights -- that a few successful wins assures freedom -- Planet Hulk has its characters talk about their third brawl being their last without ever spelling out the 'freedom' part. I'm impressed by how well the movie retains so much of the comics' rich characterization while still keeping the pace careening ahead at such a breakneck pace. There's an enormous amount of action, but even with as much of a spectacle as it all is, that doesn't come at the cost of the writing. Planet Hulk hasn't been watered down to play to the junior set either. You don't get any shots of the Hulk with his hair singed off and a half-dozen spears poking through him, no, but with exploding heads, severed arms, and plenty of otherworldly blood sloshed around, Planet Hulk definitely earns its PG-13 rating. After all, this is a story where the Hulk's spilled blood is a key plot point. The singularly most haunting shot from the comics finds its way into the movie as well. Of course, with Marvel having licensed so many of its characters out to different studios, not everyone was available to pop up in this movie. Reed Richards is a murky shadow early on, the Warbound loses the nameless Brood, and the lawyers even managed to keep the Silver Surfer out of the fray. Reed's not missed, though, and as awesome as it would've been to see one of the Brood splashed across a 60" HDTV, it's not as if the Warbound is exactly hard up for membership. Rather than sulking about losing out on the enslaved Silver Surfer's battle with the Hulk, Planet Hulk's producers chucked Beta Ray Bill into the mix. The smart money says you're having one of two reactions to that. Either you're asking yourself "...wait, who's Beta Ray Bill? ", or you're not saying anything at all what with your jaw scraping its way across the floor and all. Beta Ray Bill comes out of left field, sure, but seeing that Asgardian-fueled Korbinite whack the incredible Hulk with a giant hammer is about the biggest nerdgasm I've had in the past year and change. 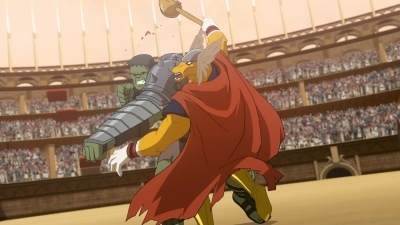 I was digging everything else about the movie up to that point, but Beta Ray Bill alone sends Planet Hulk screaming somewhere towards essential viewing. Scattered around are a gaggle of other cosmic cameos, including the Grandmaster and Adam Warlock, so keep your eyes peeled. uprising led by the Hulk is lost...it doesn't feel like a war anymore, coming across more like just another power-mad villain screaming out to be overcome. Quite a bit of Miek's story has been snipped out, including his transformation and the embrace of his fellow natives. The Spikes have been simplified quite a bit into just being a biological weapon, and the Red King meets a different end in the movie. I will admit that the idea of General Hulk was one of the my favorite aspects of the original comic arc, but I don't think that would've translated to a movie like this without being at least twice the length. Most of the other changes are a better fit with the streamlined approach Planet Hulk takes as well. It's worth noting that the original comics have a much more complex and darker final act that leads directly into "World War Hulk". The ending of the movie is faithful to the comics but chooses to stop at an earlier point. There may or may not ever be a World War Hulk movie, after all, lingering on the political element would seem anticlimactic in an action-oriented movie like this, and the genocidal betrayal at the end would require the sort of lengthy setup that Planet Hulk doesn't have the time for in the first place. Regardless of the changes that had to be made, the tone of the original storyline is firmly intact, and that's what really counts. I'll also give a quick nod to the voice acting. I wasn't really impressed with what I heard in Planet Hulk's trailer, but it plays much, much better in the context of the movie as a whole. The standout for me is Sam Vincent's take on Miek, and it's eerily similar to the voice I imagined as I read the original comic arc. Rick Wasserman is a terrific choice as well, believably conveying the Hulk's gradual shift from a monosyllabic monster into a more clearly intelligent creature, but that heavy, almost feral breathing between lines makes it clear that the beast could once again seize control at any moment. "Planet Hulk" is one of my favorite mainstream comic arcs in many, many years, and when I heard that an animated version would be coming down the pike, I was half-excited and half-skeptical about whether or not such a colossal, epic storyline would translate all that well to a barely-feature-length animated movie. Its premise is far removed from the usual "Hulk smash!" story -- although there's no shortage of destruction -- and viewers with more of a casual interest would probably be better off picking up Hulk vs. before tearing into this one...starting off with something a little more traditional. One of the great things about Planet Hulk is that it's so easy to recommend to comic and animated action fans no matter how they feel about the character. It's one of the best Hulk stories this side of Peter David's epic run, yet it veers far enough away from the usual mythos that those who've found the Hulk to be kind of stale ought to feel as if they're watching something entirely different. 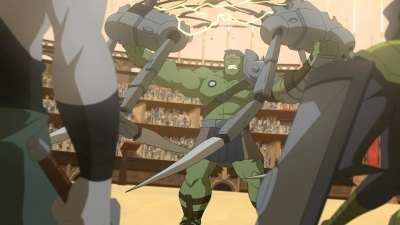 Planet Hulk is an outstanding adaptation of one of the most exceptional comic arcs of the past decade, and both this movie and the original comics come very, very highly recommended. Planet Hulk looks about as perfect as I could hope for on Blu-ray. The very fine linework definitely benefits from the additional resolution that high-def has to offer; there are some shots where the camera's pulled back extremely far -- like the brawl against the Devil Corker -- when the Hulk would probably just be a tiny green smudge on DVD but manages to remain crisply and clearly defined here. A few scattered moments are unexpectedly soft, but most of this looks to be intentional. The colors also come through perfectly on Blu-ray. Much of the movie is dominated by yellows, browns, and ashen grays -- it's set on a rocky, barren, desert planet, after all -- but the hues are impressively bold when they have a chance, especially the brilliant blues and lush greens during the Asgardian throwdown on Korg's home planet. Though backgrounds sometimes looked just a bit unstable when I was giving Planet Hulk a second pass on my computer, the AVC encode looked to be rock solid from a normal viewing distance on my HDTV, and I guess that's what's counts. Aside from some occasionally choppy animation early on, I really don't have any complaints at all, and this Blu-ray disc ought to be well-worth the extra couple of bucks over the DVD release. 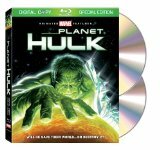 Planet Hulk is presented on this BD-25 disc at its original aspect ratio of 1.78:1. As great as Planet Hulk looks on Blu-ray, its eight-channel DTS-HD Master Audio soundtrack somehow manages to top it. The clarity and distinctness of every last element in the mix is phenomenal. Even with all of the havoc being wreaked here, every line of the movie's dialogue is rendered cleanly and clearly, never once struggling in the mix. The low-end is tight and punishing, and all of the punches, kicks, blasts, slammed tendrils, and bodies being flung hundreds of feet across the screen all hit like a slug in the gut. Even Korg's growl and the Hulk's heavy breathing are reinforced nicely in the lower frequencies. Although there's a very strong sense of imaging and directionality across the front speakers, the action doesn't really attack from the surrounds all that often. It's an atmospheric mix that does take advantage of the multichannel setup -- Caiera's childhood home crumbling around her, grit and dust settling as the Hulk tumbles to the ground, and swarms of Spikes raining from the sky -- although pans across the surrounds and discrete effects in the rears are kind of sparse overall. That's somewhat disappointing, sure, but since everything else about this soundtrack comes through so flawlessly, the limited use of the surrounds is easily shrugged off. Planet Hulk also features a Dolby Digital 5.1 dub in Spanish along with subtitles in English (traditional and SDH) and Spanish. The first of the extras on this Blu-ray disc is an impressively thorough behind-the-scenes featurette. Much of the conversation swirls around taking a 400 page story and effectively condensing it down to just 70 minutes and change, including the decision to end Planet Hulk at a different and more optimistic point than the original comics. Also explored in detail are the character designs, staying as faithful as possible to both the original story and its artwork, lining up the voice actors, delving into the specific choices of color in the movie, and explaining why exactly Beta Ray Bill is standing in for the Silver Surfer. It's a bit strange that somewhere around a quarter of "A Whole World of Hurt"'s runtime is devoted to the title sequence, as impressive as it is, but that's okay. For anyone who doesn't have time to dig into a full-length audio commentary, "A Whole World of Hurt" is the most essential of the extras on this Blu-ray disc. Let the Smashing Commence! The Saga of "Planet Hulk" (11 min. 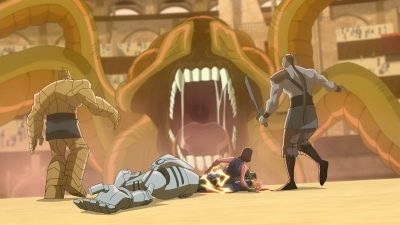 ; HD): Writer Greg Pak and artist Aaron Lopresti tear into the creation of the original arc from the comics, and the two of them touch on virtually everything: reshaping the skeletal concept Pak was pitched into such an epic story, the collaboration between Pak and the handful of pencillers that contributed to the arc, hammering out Miek's stylized dialogue, and even some of the specific coloring choices that subtly convey the Hulk's growing dominance over this barren planet. Pak also speaks about the legacy of this storyline, including the "World War Hulk" arc that followed and "Skaar: Son of Hulk". Audio Commentaries: Producer Joshua Fine and writer Greg Johnson are the driving force behind the first of Planet Hulk's two commentary tracks, and it's definitely worth setting aside a little over an hour to give it a listen. Their comments about reshaping the colossal comic book arc into a fairly short movie are incredibly detailed, not merely pointing out the differences but explaining precisely why they made many of these choices, such as the lack of Bruce Banner, why the Brood didn't make it in, and snipping out two of the Warbounds' flashbacks. The commentary is primarily rooted around the construction of the story, but even with that intense focus, the two of them are never at a loss for anything to say. It's a really great commentary and absolutely comes recommended. The other track with director Sam Liu, character designer Philip Bourassa, and key background painter Steve Nicodemus, though...? It's supposed to be more technically oriented but instead kind of stumbles along awkwardly. It just doesn't flow the way the first commentary does, and I didn't really come across all that many highlights to jot down. Some of their comments include trying to convey as much about the characters through their design as possible to help deal with the lean runtime, delving into the mix of 3D elements in with the 2D animation, and pointing out more of the cosmic cameos lurking in the background that I missed the first time through. Oddly enough, they lob out a completely different explanation about why the Hulk doesn't transform back into Banner. Huh. This isn't the worst commentary I've ever heard, but there's a little too much overlap with the other track, the three of 'em don't sound all that at ease in front of the mic, and there just isn't enough here to make it worth a spin. included is a complete episode of Wolverine and the X-Men, although the rest of the team only pops up in the title sequence. This time around, Nick Fury extorts Wolverine into shipping off to Canada to cut down the rampaging Hulk. It's not the first time they've squared off, and the Hulk is still holding more than a little bit of a grudge. Their brawl is interrupted by the real reason Fury dumped Wolverine into the Canadian wilderness, though... This is a decent enough episode, and for anyone carving their way through a double feature with Hulk vs., "Wolverine vs. Hulk" might make for a good segue into Planet Hulk. Thor: Tales of Asgard Teaser (6 min. ; HD): Following a short trailer, this Blu-ray disc features the first few minutes of Marvel and Lionsgate's next animated adventure, Thor: Tales of Asgard. Motion Comics (24 min. 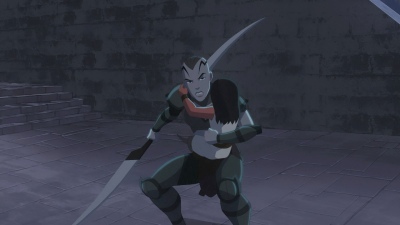 ; HD): The first of the two motion comics on this Blu-ray disc is "Spider-Woman: Agent of S.W.O.R.D." In the proudest Brian Michael Bendis tradition, the premiere "issue" is pretty much nothing but setup: Jessica Drew, sporting a British accent that I'd never thought of her as having in the comics, being inducted into a covert agency tasked with keeping an eye on the aliens skulking around the planet. The backdrop shifts to Madripoor as Drew hunts down her first target, a shapeshifting Skrull. Alex Maleev's art is, as always, gorgeously gritty, and despite that little quip earlier, I really do like Bendis' writing when it's noirish and dryly witty like this. Still, the comic is kind of inaccessible to readers who aren't steeped in Marvel continuity, the voice acting's pretty bland, and there's not all that much of a hook to make me want to dive straight into issue two afterwards. Clocking in at 14 minutes, the longer of the two motion comics is a lightly animated version of Joss Whedon and John Cassaday's debut on "Astonishing X-Men". Quite a bit more happens this time around, with Kitty Pryde making her return to the X-Mansion, Cyclops and Wolverine squaring off, the formation of a new X-Team to...well, astonish the public in the same way that the Fantastic Four and the Avengers do, and teases for the two world-ravaging plot lines that'd drive quite a bit of the rest of the series. I'd rather re-read the original comics, to be honest, but this animated version is a solid introduction to the book just the same. Music Videos (6 min. ; HD): Snippets from the motion comics for Spider-Woman and Astonishing X-Men -- including excerpts from issues other than the ones featured here -- have been recut into music videos. The Spider-Woman theme song, "Watch Your Step", is peppered with awkward, goofy lyrics like nods to the tangled web that Jessica Drew weaves, while the X-flavored "Rise Up" is a low-energy rap...kind of a lower thread count take on Linkin Park. They're both pretty embarrassing. Trailers and Ads (7 min. ; HD): Last up are plugs for Ultimate Alliance 2, a few of the free Hulk-centric games on marvelkids.com, Hulk vs., and Battle for Terra. The second disc in the set is a digital copy for use on iTunes and Windows Media-powered devices. Planet Hulk comes packaged in an embossed slipcase boasting some terrific painted artwork by Alex Ross. Startlingly faithful for a seventysomething minute adaptation of such a sprawling epic, Planet Hulk deftly melds quite a bit of the intelligence and characterization from Greg Pak's comics in with the unrelenting action and devastation you'd expect from a movie with the Jade Giant scoring top billing. Admittedly, first-timers might probably be better off picking up the more accessible Hulk vs. as a starting point...something a little more traditional and familiar. Still, "Planet Hulk" easily ranks as one of the most exceptional arcs to hit mainstream comics in the past five or six years, and this adaptation is so much better than anything I could ever have hoped to see. 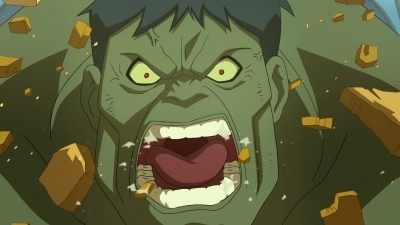 Not only is Planet Hulk one of the best of Marvel's animated efforts to date, but it looks and sounds outstanding on Blu-ray, and it's all backed by a reasonably solid selection of extras. Highly Recommended.